Massey University, Parks Australia, the Australian Department of Environment, the Foundation for National Parks and Wildlife, the Parrot Trust of Australia, the Parrot Society of Australia, BirdLife Australia, Island Conservation, the Nature Conservancy, the Parrot Society of the UK, the Mohamed bin Zayed Species Conservation Fund, Massey University and Wildmob. The Tasman or Norfolk Island Parakeet (Cyanoramphus cookii) numbers less than 100 mature individuals in the wild. 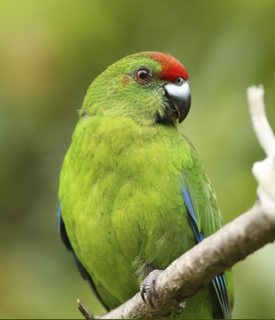 Progress and outcomes: Since 2013 WPT has been aiding conservation work aimed at preserving the last of the Tasman Parakeets in Norfolk Island National Park. The Trust supported the early stages of the project by funding two GPS units to link to satellites from the deep valleys where some of the parrots are located. Parakeet expert and researcher Dr. Luis Ortiz-Catedral conducted surveys that found no more than a dozen breeding females, a low number. To monitor breeding activity three motion-sensitive cameras were installed at different nest sites. Through mid-2014 of the breeding season 51 chicks had fledged, half of them female. Focus of future work: The Norfolk Island Region Threatened Species Recovery Plan has recommended a set of measures needed to reduce or remove threats to native species on the island. Conservation actions include control of introduced mammals and birds to minimize disturbance to females while nesting, and development of a translocation strategy to Phillip Island. By 2014, there were 78 predator-resistant nest sites, with 11 active nests. By March of 2017 at least 17 females were on active nests. The team has launched education and awareness programs to reach over 2,000 people, stressing the importance of protecting nests, keeping domestic mammals away from the parrots’ nesting areas, and for promoting native plant propagation. With your help we can increase efforts to better understand the species, and continue to deliver effective solutions to further their conservation. History: The Norfolk Island Parakeet, or Cyanoramphus cookii, is native to Norfolk Island. It was formerly found around the entire island but is now scattered in remnant forest patches in Norfolk Island National Park. It was once estimated to number at least 190 pairs. By 1994 the population had dwindled to only four breeding females and about 30 males. After a round of intensive conservation actions the population grew to just under 300 birds, but then dropped again to 150-200 in 2008. The population is declining yet again from an estimated population of 240 birds in 2010. It is now estimated at less than 100 mature individuals. Ecology: The Norfolk Parakeet is confined to the Norfolk Island National Park and adjacent forested areas and orchards. Birds take a variety of fruits, shoots, blossoms and shrub seeds. They also feed on introduced olives Olea africana.